The temperature’s dropping and it’s just the beginning. Winter is a-comin’, everyone – there’s no denying that. Rather than wish away the onslaught of the cold weather – and the unruly piles of coats that come with it – embrace it and outfit your foyer or mudroom with a great new coat rack. Coat racks have gotten a bad rap as eyesores, an unnecessary piece of furniture to stub your toe on and look messy. After all, why invest in a separate entity draped with coats that don’t stay on it when you can use a couch or chair instead? These coat racks are going to destroy that sentiment. Not only are they functional and practical (because, let’s face it, nobody really wants coats flung over their couches), they’re design elements in their own right. Many even serve dual purposes! First up: an updated twist on the literal coat tree. Lots of new coat racks are designed to act as stand-alone pieces of art to conceal their very coat-rack-ness. The pegs on this clever and colorful rack fold in when not in use. No more snags and head-bumps in the summer months! Need your coat rack to do double duty? These are for you. Use a shelf/rack to stash more than just coats. And to introduce some fun – and some fitness – into your daily routine, hang your coats and other paraphernalia from this rock wall coat hanger. You have to climb to reach your stuff! Hi Freida, which one are you interested in? You can click on several of them to find out where to buy. If the one that you like is not linked, post here and we will try to help you find it. Hi Yael, I would love to find out where to purchase/price of the 3rd wall mounted art piece (tree featured) and the wall mounted wooden piece with storage for keys etc. When I click on each image They are not hyperlinked to any buying information. Thanks so much. Hi Lisa, thanks for visiting! 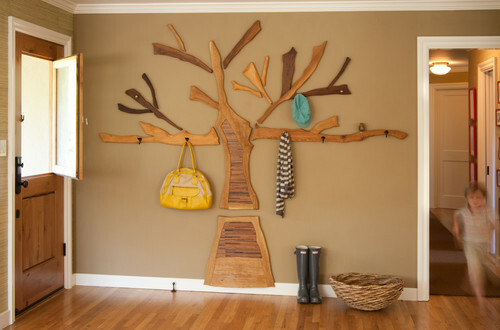 The wall-mounted tree was custom-designed, and the wooden piece with key storage included plans for a DIY project that is unfortunately no longer active. I hope you find something that you love soon!